The political processes in both Greece and Macedonia/FYROM are still adjusting to the surprise victory by Prime Minister Zoran Zaev in the October 19 vote in Skopje where his supporters and allies delivered 80 votes or the required 2/3 majority in parliament needed for the constitutional revision process to proceed, as required under June’s Prespes Agreement that aims to settle the Name Dispute between the two countries. In Greece the adjustment took the shape of a day or two of loud discussions over the future of the coalition government, then a sharp pivot to another foreign policy domain, tense relations with Turkey over the delimitation of Greece’s maritime boundaries, possibly including the Aegean Sea. Following the latest poll, Zaev’s government has 15 days to finalise and submit the draft amendments to the constitution to parliament. A vote will be required but a 2/3 majority is not needed in this instance. Zaev has indicated his intention to accelerate this process. After the amendments are passed, there is a period allocated for public discussion and debate. Sometime before the end of the year, a third vote will be taken, which will require a 2/3 majority for approval, providing the opposition with one last chance to make its point and block the deal. Debate continues in Skopje on whether the actual number needed for a 2/3 (enhanced) majority vote is 81, as previously believed or simply 80 as asserted by the Zaev government and the Speaker of Parliament, Talat Xhaferi, at the time of the vote on October 19. Eagle-eyed observers in Skopje even reported the change in the Wikipedia entry by an unknown editor regarding the 2/3 majority requirement, lowering the number from the previous 81 to 80. Opposition VMRO-DPMNE leader Hristijan Mickoski took rapid action against the seven MPs from his party who voted to support the constitutional changes and announced their expulsion from the party shortly after the October 19 vote. Mickoski said “they will now have to live with this shame,” while also accusing the Zaev’s government of exerting pressure and blackmail on their MPs. The eight opposition (seven were crossover VMRO-DPMNE) MPs whose votes were essential on October 19 issued a statement with four demands in order to deliver further support to Zaev, the most interesting of which was for the formation of a national reconciliation commission. That was quickly established in the days after the vote; it is unclear whether the MPs are demanding full amnesties for previous violations including the infamous April 2017 parliamentary rampage which injured over 100 people or whether the commission’s approach will satisfy them. The media in Skopje is reporting that what has been done so far does not appear to go far enough to satisfy their demands. 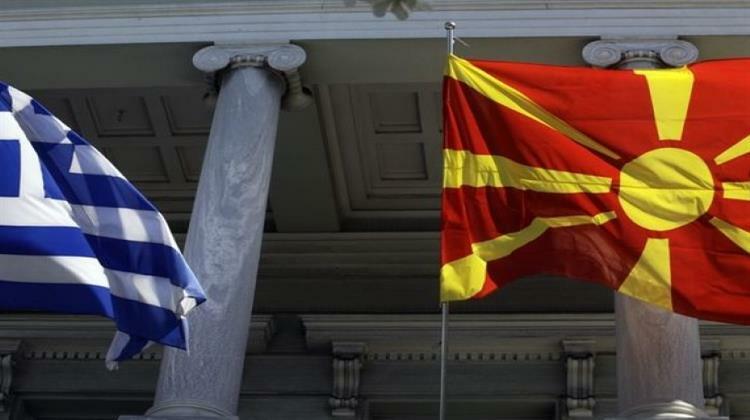 The Prespes Agreement remains on track in Skopje following the October 19 vote, but now the Greek political timeline largely reverted to what analysts had envisioned before the failed September 30 referendum. That meant the agreement would arrive in Athens for ratification sometime in early 2019, and the long-predicted rupture between SYRIZA and the Independent Greeks (ANEL) party over the deal with Macedonia/FYROM would trigger a political meltdown and new elections later in the spring, most likely May. Some analysts now see the possibility that an early completion of work on the constitutional amendments in Skopje means an earlier-than-planned arrival of the treaty for ratification in Greece, meaning elections could well have to be called some months before the May 2019 European elections. Main opposition party New Democracy, with a widening lead in recent opinion polls, continues to press for early action and is actively reviewing the few scenarios that exist to trigger elections before the Prespes Agreement arrives in Athens, most requiring cooperation with ANEL and all other opposition parties in a no-confidence vote. In this context, the shift of attention in Athens in recent days towards Greece’s dispute with Turkey over delimitation of its territorial waters is important. While it shifts attention off of the Name Dispute where the government of Prime Minister Alexis Tsipras is widely seen as making unnecessary concessions in return for no real gain in terms of foreign policy, taking steps that headline the dispute with Turkey offers Tsipras the chance to take a tougher line against the country’s main historical antagonist and thus build support for a few more months in power.